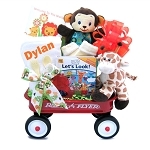 At Gift Prose, we offer a variety of gift baskets specifically created for the New Baby’s arrival. 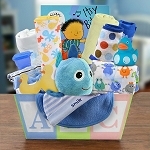 Such a blessed event of welcoming the loved one into the world can be perfectly complemented with a personalized gift basket from our huge variety of items in stock. Special themes with dolls, blankets, baby items and keepsakes are available in a full range of new baby gift basket choices. Whether it is a new baby of friends, co-workers or the new part of your family –we have something for everyone. With so many items to choose from for the new baby, drop in and browse around. We are certain you will find the perfect gift basket at the right price. If you have any questions or inquiries, contact us or call our excellent customer service personnel at: 866-933-GIFT and we will accommodate your desires in helping you find the perfect gift basket for the new baby.